Bringing an adopted pig into the home is a huge commitment. Make sure you are well prepared, through education and the right environment. A large part in the success of the adoption will be your choice in pig. A well matched placement will have the smoothest transition with the least stress on the family and the animal. Pigs are given up for a variety of reasons. Some pigs seeking adoptive homes have been well cared for in a loving family. Other pigs have had a very difficult life and need specialized care. A more experienced home may be able to take on a pig lacking socialization or a more challenging pig. 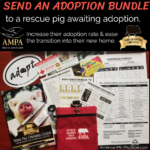 On the other hand a first time pet owner would be better suited for a rehome where the pig was well cared for, well socialized, trained, taught manners, and is comfortable with basics like car rides, harness, and baths. Once you have decided you would like to adopt a pig, the next step is to figure out what you want of that pig. What type of personality are you looking for, what types of things do you want to do with the pig, and what exactly do you have in mind? How flexible are you if the experience doesn’t pan out the way you thought it would? What will you do if the pig doesn’t settle the way you expected? Take time to think through what you envision your adopted pig to be. Another consideration is your preference on adopting from an individual, a local shelter, or a rescue organization. Pigs in each of these environments need homes. There is no right or wrong way to adopt. Think it through and follow your heart. Why do I want to adopt a pig? Do I have a good environment for the pig? Will the pig be happy in my home? Am I willing to alter my lifestyle to accommodate the pig? Who will be the primary caretaker? Who will take care of the pig if I am ill or out of town? Have I met and interacted with a pig, talked to other pig owners, and have a good idea of what I’m getting into? Am I zoned for a pig? What size do I expect? What age or gender do I want? Is veterinary care in my budget? Consider ages of household members. Will small children get along with the pig? Will older children have visitors at the house that feel threatened by the pig? Will young adults be leaving for college in a year? Where will I be in 5 years? 10 years? 20 years? Can I provide a stable home for this pig for his lifetime? How much time am I looking to dedicate to this pig? Do I want one or two pigs? Do all family members want the pig? Are all family members willing to work through behavioral issues as the pig adjusts? Will my other pets have a conflict with the pig? Have I thoroughly researched the behavior, needs, and care of pigs? Have I considered the drawbacks of owning a pig? Will the pig live inside or outside? How will the pig avoid severe weather? Do I have a veterinarian ready to care for my pig? If my new pig is not spayed or neutered, can I afford that expensive surgery right away? Do I have enough outdoor space for the pig? Am I willing to sacrifice my yard for the pig? Do I have poisonous or toxic plants in the yard that could harm the pig? Is my fencing sturdy and appropriate for a pig? Do I plan to move in the near future? Do I travel often for work? Do I have any vacations, surgeries, or other planned events that will affect the adjustment period for a newly adopted pig? How much socialization do I want to do with my pig? Do I want to take him to picnics, the lake, the pet store, and other public places? If so, consider a pig that has been well socialized. Can I afford the adoption fee, immediate medical needs, and basic supplies including fencing? Do I want a pig that is a well behaved pet that has already been trained and desensitized to everyday family life? Or do I want a rescue story that speaks to my heart, a pig that needs me as much as I need him, that will take more time, dedication, and patience? If the pig starts exhibiting unexpected behaviors, what will I do? What is the breaking point that I would return the pig? Rooting? Escaping? Charging? Biting? Biting a kid? How far am I willing to go? Do I want to adopt locally so I can meet the pig before making my decision, or drive long distance and pick up on the spot? Do I have a limit on the adoption fee I am willing to pay? Do I have a preference in the organization I adopt from? A legit 501c3 organization or a single owner getting rid of their pig? What are the most important aspects for me? Age, gender, personality, appearance, the need of the pig? If I already own a pig, what do I expect the introduction to be between the two pigs? How do I think a second pig will change the dynamics of the house? What if it’s not everything I hoped it would be? What if the new pig doesn’t bond with me? Am I ready for an active, intelligent, demanding, loud, and destructive pet? If somehow the adoption doesn’t work out, where will the pig go? Will the rescue or previous owners take the pig back? How do I ensure his life isn’t in danger? Is this something I want to commit to, for the rest of this pig’s life? Our foster dogs are currently wearing ID tags donated by Dog Tag Art. Visit Dog Tag Art today to create your own custom dog tag for your pet.